Lots of work done during February (and early March), yet silence on the blog. In fact, I’ve gotten some interesting things done over the last few weeks, most of which aren’t directly relevant to the game. Game-wise, the progress has been toward the ship designer and a fair bit of work put toward some general graphics routines which took more time than it should have. First, I’ve gotten a development environment set up on Windows and ported the game to it. Previously, I’d been working exclusively in Linux. There’s a few issues and bumps along the way, but everything basically works. I’ve done quite a bit of work that’s entirely off-topic – a few days spent sketching out what a Lisp to C++ translator might look like, a simple pixel art animation tool called McPixel (not useful for this project, but definitely for things in the future, including an idea for a side project I’d like to tackle in the near term), an NSF player, etc. A few days wasted toying with a bot for the Google AI challenge right before the deadline, which I never bothered submitting because I knew I’d need a few more to produce something competitive. More interestingly, I spent last week doing an entry for the 2010 7DRL contest, called “Laser Spigot”, which was a lot of fun to make. It is minimalist as roguelike games go (no lighting, inventory management, or experience points), but fast paced and with a polished presentation. 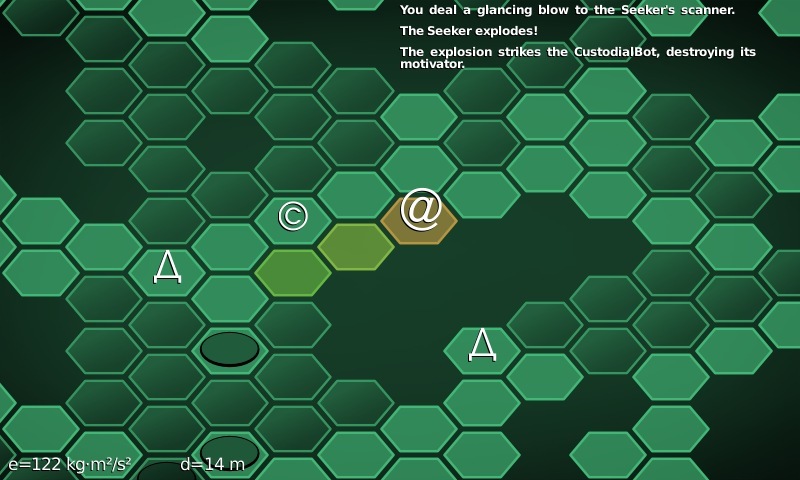 It uses a hex-based map layout. I was skeptical of this idea but wanted to try it, and it turns out to be a real joy to control, as you can map the movement directions to a 3×2 region of keys such that they fall under your middle three fingers naturally. Much more intuitive than, say, the Nethack control scheme. I’ve had reports of compatibility problems with some people’s machines running this, which I haven’t investigated yet. If anyone finds this won’t run on their machine, I’d appreciate an email with details (whether there’s a message box with an error, or if the screen just flashes and nothing happens then the contents of the file “errlog.txt” if it exists). It’s probably an OpenGL issue, but I’m sure I can work around it once I identify the problem. I plan to release a Mac version, but I can’t promise when, as I do not presently own or have access to a Mac. I enjoy the hex-based controls and the general style I’ve developed for this game enough that I’d love to build a more full-fledged roguelike around them. Laser Spigot was feature-complete on its fifth day of development – the sixth day was spent finishing the introduction screens, packaging the Windows binary, doing the web site, and fixing a couple last minute bugs, so really you could call it a 6DRL. There’s only so much I can do in five days, and at that point it felt like just piling on more stuff (monsters, items, etc.) wouldn’t do much to enhance the game play. Download Laser Spigot now! (7 MB, WinXP or later, requires OpenGL 3D accelerator). This entry was posted on March 15, 2010 at 8:47 pm and is filed under Uncategorized. You can follow any responses to this entry through the RSS 2.0 feed. You can leave a response, or trackback from your own site.